Hey there! Let’s get to know each other. Yes, I’m a nutrition expert and author, but my biggest job is being a mom to three kids. No matter what anyone says, it’s challenging feeding them healthy meals each and every day! I do my best and I hope that the tips and recipes I share here will help you too. Whether you’re dealing with picky eaters, kids who only want to eat beige food, or those who just don’t want to sit down at the dinner table, I’ll help you find solutions. I’m also a woman who likes to stay fit, active, and energetic, so I’m always checking out the latest fitness and food products that help me do that in a convenient, easy way. I’ll be passing along the ideas I’ve found that work best for feeling fabulous, while keeping it real. And I’ll pass along super discounts to all my friends who register on the site. I love to share a good deal! Frances Largeman-Roth, RDN, is a New York Times best selling author and nationally recognized health expert. Frances was the Food and Nutrition Director at Health magazine for nearly eight years. She writes and develops recipes for Parents, BabyCenter, Today.com, Cooking Light magazine and other publications. Frances is a sought after spokesperson and provides private nutrition counseling to clients through her HealthyHousecall program. Frances is the author of Feed the Belly: The Pregnant Mom’s Healthy Eating Guide and co-author of the bestselling The CarbLovers Diet Cookbook. 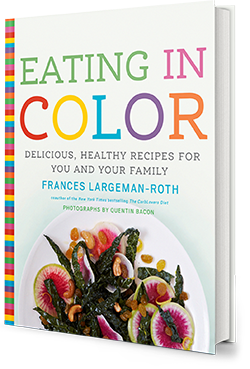 Her latest cookbook is Eating In Color: Delicious, Healthy Recipes for You and Your Family. Frances earned her undergraduate degree from Cornell University and completed her dietetic internship at Columbia University. Frances lives in Brooklyn, NY, with her husband and three kids. For more fun recipe ideas and healthy advice, follow her on Twitter and Instagram and like her on Facebook.